UK Man feeds his dog via twitter @FeedToby for naija bingo NEPA & PHCN will leave that dog in hunger ! - 9jabook & Tweeterest Digital Network ! 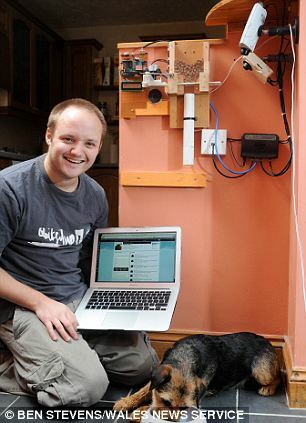 UK Man feeds his dog via twitter @FeedToby for naija bingo NEPA & PHCN will leave that dog in hunger ! 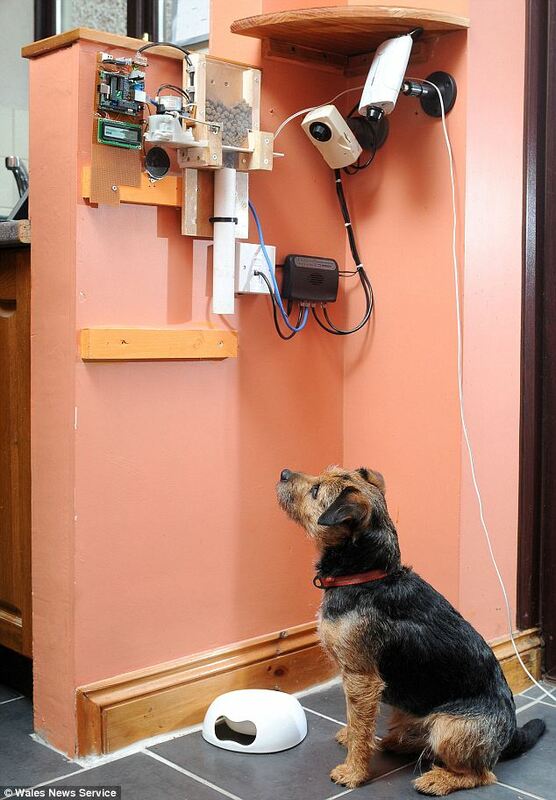 A dog-lover has invented a high-tech way of feeding his pet - by Twitter. 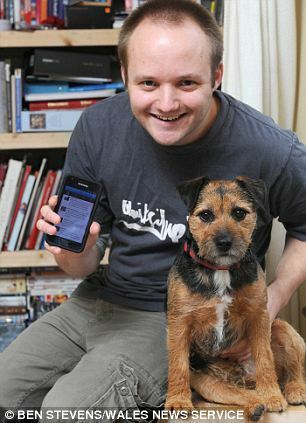 Computer buff Nat Morris, 30, has rigged up a system to give his pet pooch a ‘tweet treat’ by sending him a Twitter message. 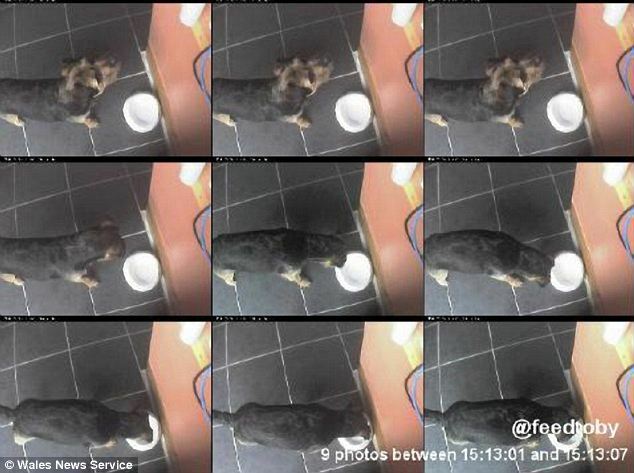 Border terrier Toby gets a snack from an automated food dispenser whenever Nat sends a message to ‘@FeedToby’. When a message is sent to @feedtoby it is received by a mini-computer known as a Nanode microcontroller. This is linked up to little motor taken from a household printer HP Deskjet 500. When the mini-computer receives the message, the buzzer goes off and Toby comes running over and sits beneath a tube under his feeder contraption. Then the motor comes to life and pulls open a trap door which releases a serving of food. The doggy treat then comes dropping down the tube and into Toby's food bowl. Then a digital camera then takes a photo of him and sends it back to Nat on Twitter - so he knows Toby has been fed. IT consultant Nat spends a lot of time working away from home and isn’t always able to feed Border Terrier Toby by hand. But using his new invention he is able to send his dog a treat from anywhere in the world. Nat said: ‘Toby absolutely loves it. At first he didn’t know what was going on. Nat loads up the feeder with crushed dog biscuits - but not too much in case four-year-old Toby gets too many messages. When a comment is received the mechanism drops a helping of crushed up dog biscuits out of the tube. And Nat has even rigged up an online camera so he can see Toby enjoying the food at his home in Milford Haven, West Wales. Nat is even considering patenting his system. But one problem is that friends and family have been amazed with the ‘Tweet treat’ dispenser. And they have been joining in to send Tweets to Toby - so Nat has had to introduce restrictions to make sure Toby doesn’t turn into Tubby. Nat added: ‘People have been sending him food at all hours of the day - so I had to limit it to between nine in the morning to nine in the evening.